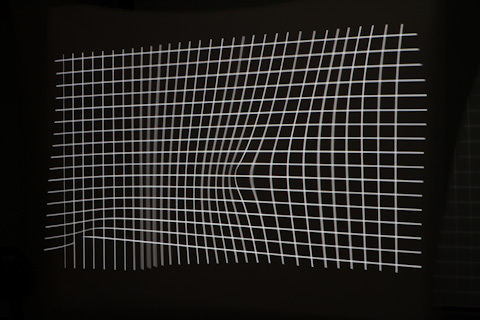 “The picture above (top) has been generated projecting white vertical rectangles, from left to right, at 25fps, to a projection screen. A camera, set to long exposure, captured the projection in 5 seconds. 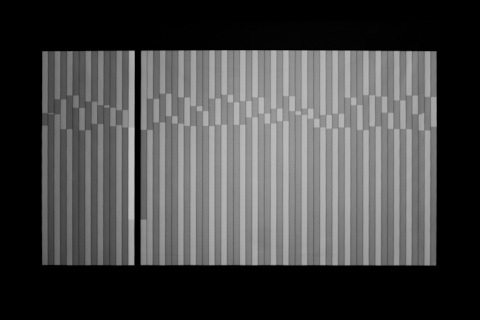 The rectangles aren’t homogeneous due to the rendering and the asynchrony between the frame rate of the video signal and the refresh rate of the projector. The light grey rectangles have been in projected (and thus, exposed) double time than the dark grey ones. The brightest stripe has probably been projected three times the dark grey ones, and there is a rectangle that hasn’t been projected. 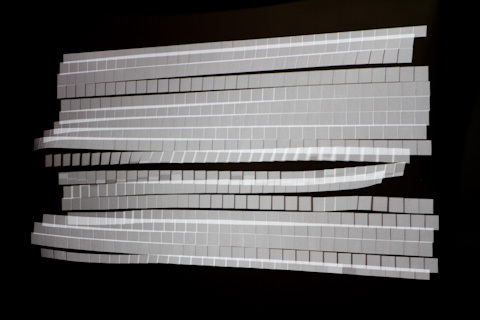 I’ve been doing some experiments using Processing to generate different patterns and sequences, a projector, and a camera pointing to the projection screen. 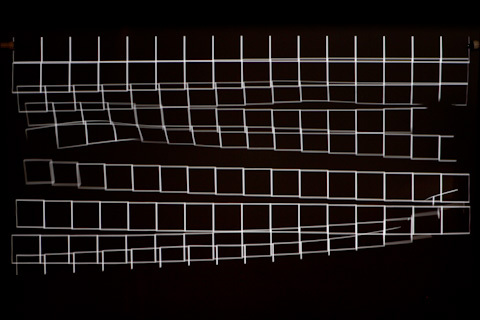 Some of them are using a technique called procedural light painting, some other combining slit-scan with projected patterns. I’m also very interested in the low repeatability of some of these experiments, like the picture above, due to the noise introduced by the asynchrony of generation, communication and output means. Maybe we can call it Generative Photography. The entry 'Ishac Bertran' was posted on February 20th, 2011 at 10:43 pm	and is filed under Uncategorized. You can follow any responses to this entry through the RSS 2.0 feed. Both comments and pings are currently closed.